Our inaugural class of Garden Seedlings at Graduation in 2016. 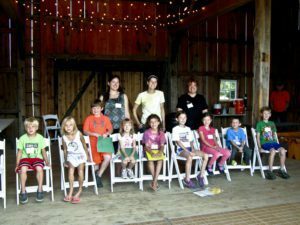 Garden Seedlings School returns this summer to bring plant-based education to children ages 6-9! For this year’s theme, we will be looking at who, and what, comes to the garden and why. Seedlings will explore Goodell through the eyes of the pollinators, pests and people that visit them. Each fun-filled day will include Garden Educator led lessons, nature inspired children’s literature, interactive Garden tours and hands-on crafts and activities. Garden Seedlings is designed for students in Kindergarten through 3rd grade (ages 6-9). Classes will be held on Wednesday mornings for an hour and a half, from 11 am until 12:30 pm, in Carrie’s Cabin, and run from July 13 – August 10. The registration fee for this five-week class is $60 ($50 for members). Class size is limited to 12 children. Registration and prepayment are required to hold a spot in class. New this year, Garden Seedlings will allow parents to drop their child off for the duration of class.